On April 5, 2018, about 1600 central daylight time, a Quicksilver GT400, N2433Z, experienced a loss of control on takeoff at Maxwell Airport (3NC7), Maxwell, Iowa. The airplane sustained substantial damage and the non-certificated pilot was seriously injured. The airplane was privately owned and operated under the provisions of Title 14 Code of Federal Regulations Part 91 as a personal flight. Visual meteorological conditions prevailed for the flight, and no flight plan was filed. 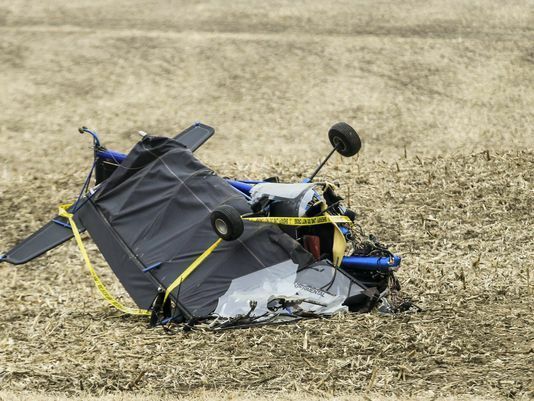 NEAR MAXWELL, Iowa (KCCI) — A man was taken to a Des Moines-area hospital Thursday afternoon after authorities said he crashed his newly purchased ultralight aircraft in rural north Polk County. The accident happened around 4:15 p.m. near Northeast 104th Street near the town of Maxwell, about 1 mile south of the Story County border. Capt. Jana Abens, with the Polk County Sheriff's Office, said the sole occupant of the plane, 43-year-old Jason Beckman, of Lake View, suffered leg injuries and what appeared to be minor lacerations to his harms. He was flown to the hospital for treatment. He is expected to survive. Ruth Williams, who lives across the street, said she saw the events unfold. "I saw the plane go down and then hit that tree down there and bang!" Williams said. The plane took off from a grass airstrip and got a few hundred feet before going into the trees and crashing into the rural farmstead. "I was hoping he wasn't hurt," Williams said. Crews remained on scene Friday afternoon, combing through the mangled wreckage of the Quicksilver GT-400. The owner of the private airstrip told KCCI that Beckman had just bought the aircraft Thursday and was flying it for the first time. A classified ad shows what the plane looked like before the crash. The asking price is $6,500. It is unclear what caused the plane to crash, but Williams said she has an idea: "I think the wind took it." An investigator with the Federal Aviation Administration said crews will be investigating the crash site Friday, and it could take up to six months for a full report to be released. FAA records show the plane was still registered to the airstrip owner. A small airplane crashed Thursday afternoon in northeastern Polk County, sending its pilot to a hospital by helicopter, authorities said. Deputies responded about 4 p.m. to NE 150th Ave and NE 104 St., about five miles south of Maxwell, Sgt. Nathan Ludwig of State Patrol said. The person injured, the pilot, was the only occupant in the aircraft; he was expected to live. The adult pilot, whose age was not known, crashed in a corn field after he took off about 150 yards south, Capt. Jana Abens with the Polk County Sheriff's Office said. The pilot suffered a visible leg injury, which Abens said may have been broken, and lacerations to his arms. He was conscious and speaking with first responders, she said. No one else was injured. The pilot was airlifted to a Des Moines hospital. It was not clear what kind of plane the man crashed. Ludwig called it a homemade aircraft and Abens described it as similar to an Ultralight. 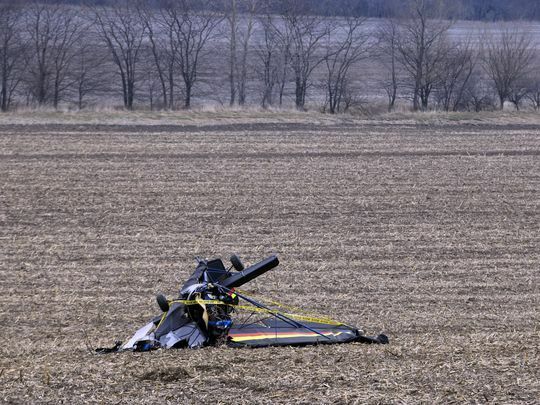 The single-seat aircraft was "mangled," Abens said. The scene was cleared by 5:30 p.m. Authorities in Story County and Polk County responded to the scene. The Federal Aviation Administration is investigating the crash.